Can the Cosmetic Caddie Really Organize Your Getting-Ready Essentials? Does Cosmetic Caddie Really Work? The Cosmetic Caddie is a multi-tiered storage unit meant to make heads and tails out of your bathroom countertop and get all of your make-up and getting ready essentials all organized in one place. But how well does it work and does it have any features that can’t be found elsewhere? If the lack of organization of all of your toiletries and products that you use to get ready each day is causing you to lose time, you’ll definitely want to take steps to get more organized so that you know where everything is and can easily switch from item to item. The makers of Cosmetic Caddie claim that the unique basket design means that this is a simple storage solution that makes it easy to reach and see everything you need. They say that when you compare this to using a makeup bag, or storing all of your cosmetics in drawers, it’s more convenient and you can easily take things out and put them back. They say it will clear up your counter space so that you can put other things there, or leave it empty giving your bathroom a cleaner, neater look. This is one product that isn’t totally overhyped, it’s basically just showing what it does, which is to store your cosmetics and other bathroom goods. It does address a common problem, and one that doesn’t typically get addressed by many products, aside from general storage solutions. Cosmetic Caddie is $29 and you end up getting two of them shipped to your door. That breaks down to $14.50 each, which isn’t bad, and you can split the cost with a friend if you don’t need two of them. Storage bins and solutions can run up to $20 or more so this price is keeping up with the competition, and if it solves your problem is well worth it. This should act to save you time in the morning when you’re getting ready, or anytime that you need to find something in the bathroom. If you don’t like the feeling of stress that comes from trying to get ready too fast, like when you oversleep or are simply running late, each second counts and if you can move through the process more efficiently you’ll feel better while getting ready and not feel so frantic. Cosmetic Caddie is not an entirely unique product, but one that serves a particular purpose. 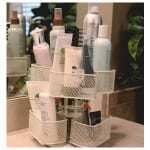 It’s a simple rotating storage unit with baskets, so you don’t have to worry about it not working. It’s really a matter of deciding if this is the storage solution that will work best for you. It can be used to help pare down your cosmetic collection, so that you can choose which ones you use more often and put those in the caddie. Getting bogged down by too many cosmetics all in one place? One tip is to use the Pareto Principle. This involves finding out the 20% of the products that you use 80% of the time and putting those within easy reach. The other 80% of the products don’t really need to be out and at the ready, because you only use them on occasion. If you have so many products that cutting out 80% of them still leaves you with a lot leftover, you can run it again and take 20% of the remaining products. So lets say you have 100 different things currently on your bathroom counter. You’d first pick your top 20 most frequently used items. From that 20 you can get it down to 4 or 5 things that you use all the time. By keeping those at the ready you’ll be saving yourself time, and keep the others close by because you’ll still need them frequently. Cosmetic Caddie is getting our Solid Try rating if you feel that it will look right in your bathroom and help you out. We found no indication that it doesn’t live up to its claims and the simple design and construction mean that it’s likely a winner. The fact that you have to order two of them is kind of a drag if you don’t need the spare, but you can always repurpose it if you need to organize other areas of your home or even in the garage. Storage systems and containers come in all shapes and sizes, and there’s no shortage of options here. You should only go with one that you feel will meet all of your needs and provide the organization that you’re lacking. This is a good way to help sort things out because there are different baskets, so you can separate your items by brand, or by what they do, such as a basket for eyeshadow, or a basket of all Urban Decay products. What do you think? Does Cosmetic Caddie work or not? Does Gyro Bowl Really Work? Does the Light Angel Really Work? Does the Fizzics Revolutionary Beer System Really Work? Do I have an obnoxious amount of makeup! Oh yes! Is this product entirely unique? Well, not quite. While it does contain various purposes and uses (such as holding items other than makeup) it’s not quite anything new on the block. However, the price is pretty great, especially if you are getting two at the price of $14.50 a piece. I can’t speak for the quality and say that while it’s not anything to write home about, it’s definitely not bad either. Overall, if you feel like this is the makeup holder for you and you’re willing to buy two or split the cost with a friend, then the Glam Caddy is not a bad deal.